Crostini are wonderful little appetizers. 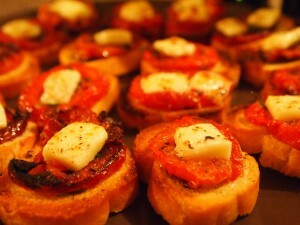 These use slices of baked tomatoes which are extremely flavorful. Preheat oven to 375 degrees Fahrenheit. Place roma tomatoes into a deep baking dish or two. Drizzle the tomatoes with olive oil and lightly salt. Bake for one hour. Ideally the tomatoes will have some slight carbonizing on their bottoms. Use a stiff spatula to scrape the tomatoes from the pan(s), being careful to keep them relatively intact. Heat the oven to 425 degrees Fahrenheit. Place baguette rounds on a baking sheet and bake for 5-7 minutes. Remove from oven, keeping the toasted baguette pieces on the baking sheet, then drizzle (or spray) lightly with olive oil. After the tomatoes and baguettes have finished, heat a few tablespoons of olive oil in a small pan on high heat. Quickly fry the rosemary in the hot oil, about 30 seconds. Remove rosemary and place on a paper towel to soak up excess oil. You can save the excess oil, now flavored with rosemary, for another dish. Place baked tomato slices on toasted baguette rounds. Add a few of the fried rosemary leaves to each crostini. Top each with a small amount of feta and season with ground black pepper. Set oven to high broil. Broil the crostini on the top rack of the oven for three minutes.